It was a big week for us. Baby number two arrived mid-day on Monday and to say our lives changed is an understatement. So much was different this time around and when I have the energy and the swelling in my ankles and my headache has subsided I will definitely be writing more about it. One big concern I had as the big arrival approached was how big brother was going to do. J has been, since he was born, a gentle, sweet and caring little person. He knew there was a baby in mommy’s tummy and would often refer to baby brother, baby’s room, baby’s crib and in general just be very sweet whenever we talked about it. There’s talking about a baby and actually meeting one though and that was my big concern. 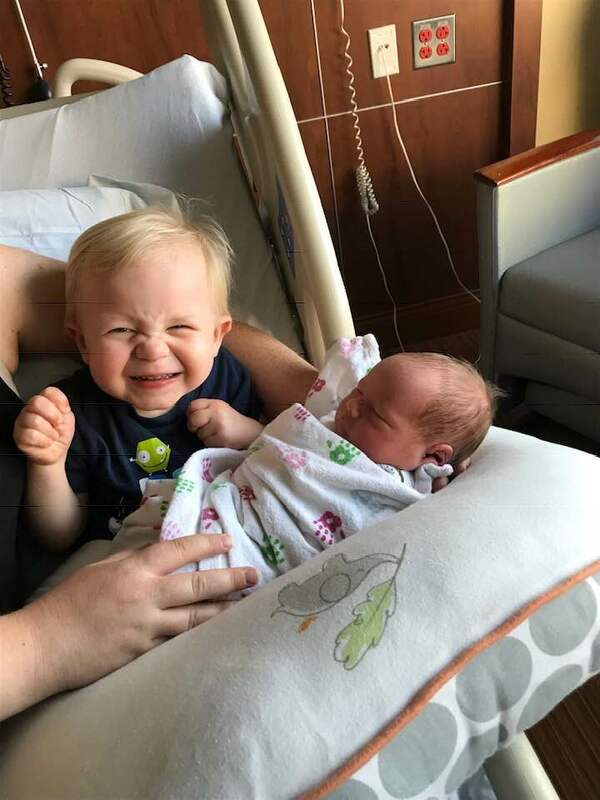 Grammy and Papa brought big brother to meet baby T on Tuesday and all of my fears were calmed. J immediately asked to hold baby brother and did so gently and with a huge smile on this face. We’ve been home with everyone since Thursday and I am happy to report nothing has changed. J will ask mommy to hold him and wants to play, but is patient when he knows it can’t be right now. The sweetest moment from the whole experience with these two so far happened today. I was feeding baby T on our bed and J had climbed up to help hand me the bottle and burp cloth and was bouncing around a bit. I reminded him that we had to be gentle a few times and he put his hand on my shoulder, looked at me sweetly and said, “I know mommy.” Instant water works for me at how sweet and understanding this little man could be and when he saw me start to cry he immediately asked, “mommy sad?” I quickly became a puddle. I feel so blessed and can’t wait to see what’s to come in the next weeks with these two. << Previous Post Are You A Rule Follower or a Rule Breaker? Next Post >> Freight Train's don't stop me! Erin is a Professional. Wife. Mother. She’s driven by her family, friends and a desire to put good out into the world. On the occasion that she has more than a minute to spare between work, momming and meal prep Erin likes to sew, bake and think about what would look great with a coat of chalk paint (she has yet to complete a single project).